The original sleevenote for The Young Ones speaks of young Nicky Black (Cliff) and his chums’ stance against “the narrow and disappointing adult world,” so it comes as a great if predictable pity that so much of the film’s soundtrack seems bent on pleasing and doffing its multiple caps to the adults. The plot of The Young Ones is a cannibalised twisting of Babes In Arms, and as songs such as “Nothing’s Impossible” and “All For One” demonstrate, that’s not all it borrows from the thirties. Despite the potentially intriguing conflicts between the bad face of free market economics (that Cliff’s dad, creepily played by Robert Morley, can buy up his youth club and as many buildings as he wishes and close them down/demolish them without fear of reprimand or censure) and the good face (the plot’s surprisingly early deployment of pirate radio and even pirate TV), the film kowtows to the status quo just as surely as Cliff will stand up for his dad at the end and in doing so ensures that his club – apparently set in Paddington, but it’s not an early sixties W2 that either Michael Bond or Peter Rachman would have known – survives. Spirits immediately sink with the opening bustle of “Friday Night,” musically reminiscent of those old Scotland Yard potboiler shows which always opened with a stern voice announcing “ London! Hub of the Universe!” before cutting to stock shots of busy Piccadilly Circus traffic and then Harry H Corbett in the cop shop, dolefully attempting to solve that week’s case. Various Sammes singers proclaim in uncomfortably varying accents – Cockney, RADA and mid-Atlantic – their unconvincing passion about the evening to come: “We’ll learn more tonight than we do at home,” before the music glumly thumps into a series of pastiches (West Side Story, Carousel, “Wheels Cha Cha”) and a dull cry of “See you at the dance tonight!” – West Side Story’s “Tonight” stripped of all its threat and ambiguity. Who knows? They might be real devils and stay up as late as ten! Cliff and the Shads then proceed to stride straight into the number and admirably rip it up (to a point) with the moderately engaging but finally rather troublesome “Got A Funny Feeling.” Although Cliff growls and hiccups like a non-defected believer his Presleyisms are slightly forced and sentiments such as “Yes, you’re the one/Don’t try to run” regrettable (to say the very least). The song’s most interesting element is the John Cale-pre-empting one-note high piano motif which doesn’t quite chime in concordance with Hank Marvin’s guitar solo. After “Peace Pipe,” a pleasant but by-the-book Shadows workout, Cliff seems to fit right back into 1952 with the feeble Palais swing of “Nothing’s Impossible” which despite rhyming “slab of granite” with “plan it,” offers nothing against which Hamilton Black would offer complaint. Ms Frame joins in midway and does her best (despite Cliff’s woefully underfed cry of “Ah, sing it, sister” – Beyoncé he is not). By the time Cliff proclaims “Those trumpets hit that rock ‘n’ roll beat” – those trumpets? – the war is already lost. The seemingly inescapable Tepper and Bennett were prevailed upon to write a couple of songs for the movie but both are among their more convincing. The first is the title track, which as a single topped the charts over the exact same period that its parent album did, and moreover became the first single by a British act to debut at number one; it’s not a bad opening for its year, the first of several 1962 chart toppers to offer that wistfully hopeful horizon of the sea beyond Tilbury Docks, the opened air, the brighter new future proferred on the planners’ breezeblocks (see also “Wonderful Land,” “I Remember You” and above all “Telstar”), Norrie Paramor’s seesawing arches of strings flying like semi-liberated seagulls over Hank’s buoy-like guitar and Tony Meehan’s cymbal samba crests of the Newer Wave. Plus that never more hopeful purity of Cliff’s voice, a sense of quiet determination set within his eagerness which for whatever reasons always reminds me of Midge Ure. “Lessons In Love” again proves that when left to their own devices, as Cliff and the Shadows should have been throughout the entire project, they don’t come off too badly; it’s a good song, arranged with some imagination and well (and truthfully) performed (including Cliff’s central and totally unexpected wink of “Let me show you now!”). But then we have to negotiate the dim, tempoless wastes of “No One For Me But Nicky” before landing headfirst in the Dantean inferno of the properly wretched “Vaudeville Routine,” an interminable embarrassment which the cast appear to be performing at gunpoint. At least the George Mitchell Minstrels were what they were and could be taken or left, but to hear Cliff and his colleagues rhyme “berserk and” with “working” or go through some rancid old music hall tags (with accents so arch that the “jokes” are mostly obscured) a decade after the Goons had begun to deconstruct and demolish them, or much, much worse, the Mike Sammes Singers bleating their narrow way through various whiskery old pub singalong standards, brings to mind Olivier as Archie Rice (filmed in 1960, a year ahead of The Young Ones); essays from a decayed anti-culture, despite the archer references to West Side Story and entreaties of a “great and glorious, gay, uproarious” show, and despite the notion of the history of post-Victorian live entertainment apparently culminating in “Living Doll” (disposed of in a quickfire sideways reference). “That’s showbusiness – to coin a phrase,” winks Cliff, even then acutely conscious of the importance of The Industry. Was this really what the expectant youth of 1962 wanted? “When The Girl In Your Arms” is the song credited in the film to the “Mystery Singer” (i.e. Cliff) in order to drum up publicity for his club’s fundraising concert (filmed at the Finsbury Park Empire – eventually to become the Rainbow Theatre) and the album’s second Tepper/Bennett effort, and again it works because of its relative, unhurried simplicity, the fact that both singer and Shadows can imbue themselves with the song’s hues, and the absence of any necessity to make a Big Number out of it. The “Mambo” sequence, in contrast, is wretched (and the “Just Dance” segment bears no relation whatsoever to Lady GaGa), a succession of every cliché in the post-West Side Story book, and one understands why Lennon felt the need to employ these singers to yelp “Wooooo!! !” and “Oompah oompah stick it up yer joompah!” barely half a decade later. In its final stretch, however, the record manages to find a firm connection with the 1962 present; “The Savage” had already been a top ten hit for the Shadows and remains one of their darker, more jagged moments (even though it was composed by Paramor) including a tense, frustrated drum solo from Meehan as though impatient to wait for the explosion that surely had to come. It still sounds like the most advanced thing on the album. Finally, the young troops are rallied as Cliff and the Shads romp their way through “We Say Yeah” (“Mommy say no! Daddy say no! Brother say no!”) and it could be seen as a kind of triumph; the old ways having finally been overcome and the New Britain at long last allowed to flex its lungs and breathe independently. 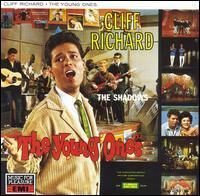 In addition, one of the bonus CD tracks is a rare instance of Cliff singing Bacharach and David; “(It’s) Wonderful To Be Young” was commissioned and recorded to fit the title the picture was given in the States, several months after the rest of the music had been taped, and its easy mastery of song construction and unexpected byways puts much of the rest of the album’s hackwork in its proper place. But catch that moment towards the end of “Lessons In Love” where Cliff plaintively whispers “Baby, love me do,” and see the wave steadily gathering in the distance. I was a big Cliff an in the 60's. I didn't see this at the cinema (just a bit too young, but I went to Summer Holiday and Finders Keepers at Hoylake's Kingsway Cinema, the same place where Eric Morecambe won a talent contents and began his career in entertainment). You might be interested to know that this whole album can be found on Spotify, including the American track and various alternative versions. The site is remarkably easy to link to, or just type Cliff Richard, Young Ones into the search bar. The song "No-one for me but Nicky" plays exactly the same role in the film as "Hopelessly devoted to you" by ex-Shadow John Fararr. Although not one of the shadows at the time of making the film, it's tempting to speculate that he saw this film and song and thought "I can do miles better than this!" and did.